Bloodroot, photographed at Atlantic Ridge Preserve State Park, Stuart, Martin County, in May 2015. As might be expected, the root source (pardon the pun) of this plant's name isn't apparent unless you dig it up. But bloodroot is fairly easy to identify even if you never see the orange-red underground parts. The combination of flat, swordlike leaves and unusual flowerhead makes bloodroot stand out at least when in bloom. It's native to Florida, found in 63 of the Sunshine State's 67 counties. It's also native to the much of the Gulf and Atlantic Coast states as far north as Massachusetts, skipping New Hampshire and Maine, and reappearing in Nova Scotia. Tennessee is the lone landlocked state where bloodroot appears. It's native to Cuba as well. Bloodroot likes it wet. 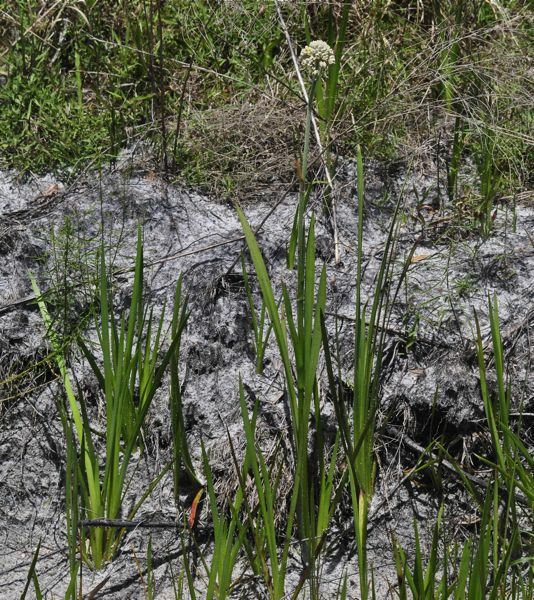 It's grows in sandy freshwater shores, in wet ditches, bogs and swamps. It can grow in standing water as well as along the edges of freshwater bodies. As noted before, the plant has orange-red roots. It also has orange-red underground stems called rhizomes that help it spread. Leaves fan out from the base. Bloodroot blooms in the spring and summer, sending out a tall stock that rises above the leaves. 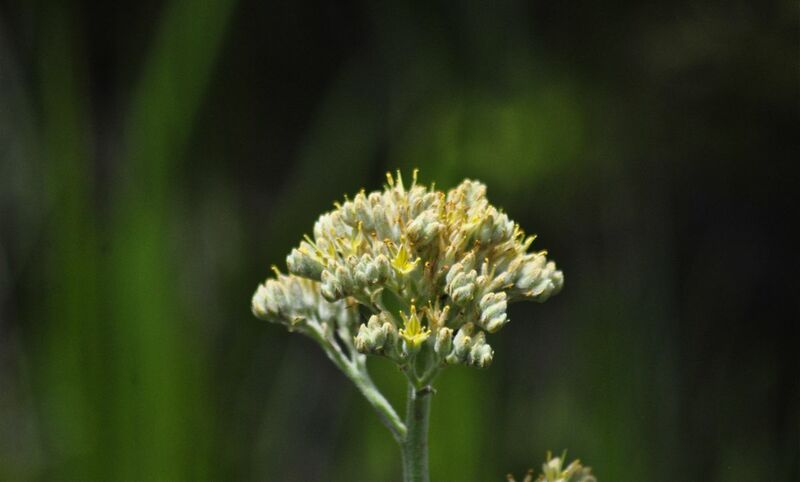 The stalk may be branched, each branch with a cluster of flowers at the tip. 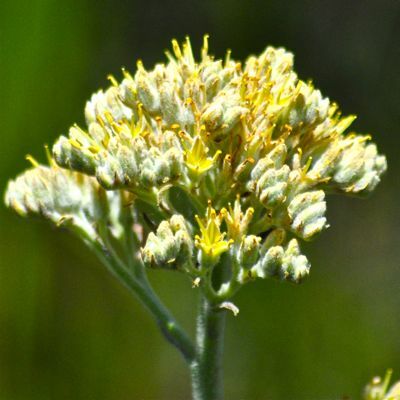 The flowers have six petals, three outer that are white and three inner that are yellow. Individual flowers are small, but they are clustered, amplifying their effect. The inner flowers are also hairy and give the flower a wooly appearance. Bloodroot is toxic to livestock but it's rarely a problem. It is a perennial. This plant was an important part of the medicine cabinet for Native Americans, particularly the Cherokee. They used bloodroot to treat cancer, spitting blood, bowel complaints, as a gynecological aid, to treat hemorrhoids, relieve sore mouths and throats and to treat venereal disease. The Catawba gave bloodroot to their horses as a tonic. The Mi’kmaq of Nova Scotia used the plant as a dye and medicine. Research has shown bloodroot extracts to have a antibiotic qualities. Bloodroot is "apparently secure" in South Florida, according to the Institute for Regional Conservation in Delray Beach. However, It's listed as endangered in Connecticut, Maryland, New York and Tennesee, threatened in Rhode Island and of special concern in Massachusetts and Nova Scotia. Bloodroot is a member of Haemodoraceae, the bloodwort family. Other names: Carolina redroot and redroot. Note: there is another plant called bloodroot commonly used in herbal remedies. It is not related.